Porsche’s GT range, at least as we understand it today, began with the 993 GT2. That rear-wheel drive, 444 horsepower, aggressively flared monster was the first use of the GT moniker on a modern Porsche. However, the car that came to define the GT line, the GT3, has much more in common with this car; the Carrera RS. Though it does not share the GT name, this 993 shares many of the hallmarks of the GT3 road cars. Though power was up only slightly compared to contemporary Carreras, the RS primarily improved performance by shedding weight. Indeed, the Carrera RS is 600lbs lighter than a 993 Turbo. Just 1,104 were produced over the model’s two year run, and Doug DeMuro is here to show you its quirks and features. A Porsche of this stature may call for more than even Doug’s typical exuberance, so please accept this very excited German man as a substitute. While Mr. DeMuro’s usual videos focus on the many pieces of equipment found in most modern cars, the Carrera RS is rather the opposite. 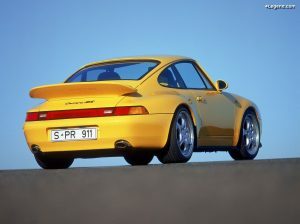 The RS is defined mostly by what it lacks compared to a standard 993. Without rear seats, door pockets, or a sunroof, the car doesn’t have much in the way of gadgets to keep Doug entertained. As a result, this is one of his shortest features in quite some time. Though it was not officially a GT car, this 296 horsepower, lightweight, naturally-aspirated 993 shares much of what makes the later water-cooled GT3 cars so appealing. Though down on power, even compared to the earliest 996 GT3, the 2,750lb Carrera RS remains a potent performer today. Just look at Doug’s face from behind the wheel. « We don’t build race cars” Alex Ross quietly muses to me before taking another bite of his fruit and nut bar. We’d just come up the face of a mountain via a demanding and technical 20-mile ribbon of pockmarked and rutted pavement, which had served to make that point blatantly obvious to me. This Guards Red 964 handled the drive in a way that felt distinctly uncharacteristic for an air-cooled Porsche. Compliance is the name of the game here, and what an intoxicating game it is. We’ve reached the summit of what must be the greatest driving road in the county (I hesitate to say state) and parked up at the base of an observatory dome. We’re above the cloud line up here, isolated from the world. Recent wildfires north of the bay have blocked our view of the real world in all directions. It’s a Friday afternoon and everyone else is stuck at their desk. The air is still and with the ignition clicked off the silence washes in to hang over us like a fog. It’s a surreal feeling. I flew hands alight and elbows akimbo on my way up the hill – dive into hairpin, fling the steering wheel 180 degrees, feed in throttle as needed, and float the steering wheel back. This process repeats itself seemingly several hundred times. I’m still moderately out of breath due to the combined altitude, physical nature of the drive, and my auto writer’s physique. Mister Ross, with whom I’ve driven a dozen times before, maintained himself cool and composed, despite the wild ride. Whether that’s a testament to my driving ability or the car’s ability to handle anything you throw at it, we may never know the answer. I’m kidding, it’s definitely the car. Between slugs from a bottle of Smart Water and the second half of his snack bar, he tells me the tale of the Porsche he bought earlier this year. It’s a 1993 964 Carrera 2 that lived a long life on the road at the hands of countless unknown previous owners. They’d collectively driven the car serious distances, but luckily each of them cared for the car quite well during their ownership stint. The paint looks well taken care of, and the interior is more or less excellent. With 964 values ballooning, he picked up what is perhaps the last truly good bargain and set to work getting it right. I’m a fan of the finished product. In day to day life, Alex is the marketing arm and one of the owners of Porsche tuning shop Sharkwerks. They’ve made a name for themselves in the Porsche world as having built nuclear-weapons-grade power from large displacement and turbocharged water-cooled engines. Whether for GT3s with 3.9 liter (and larger) high-rev engines, GT2s with over 700 horses of boosted power, track exhausts for 911R, or their everything-is-perfection Cayman GT4s, you’ve probably heard of their work. All of that said, it’s important to note that this is the car Alex wanted to build, an everyday Porsche for himself, not exactly a shop project. I’ve driven time and again in Porsches too stiff or too low for proper usefulness. Often, when given the unlimited settings of a coilover suspension system, tuning shops and owners will select a setting that would be excellent on a freshly paved racing circuit, but falls on its face when dealing with California pavement several decades beyond serviceable. Not so in the case of Alex’s 964, which leverages the traditional Porsche rear weight bias for unparalleled traction without exhibiting the pendulum swing feeling inherent in most 911s. In this Porsche the engine isn’t a bully trying to drag you sideways by the back of your neck, it’s a young child tugging at your wrist, trying to get your attention. Though the 964 chassis is often derided for being the first 911 to move away from the iconic torsion bar suspension design, it is inherently a more sophisticated design. In order to improve the car’s natural handling, Bilstein’s PSS10 coilover system provides a complete range of adjustability, and combined with a stiffer set of sway bars from H&R is more sophisticated still. Once all of that had been installed, the 964 was dropped off to Tony at TC Design for a quality daily-driver caliber chassis setup and alignment. Whatever type of suspension black magic Tony practices, it’s working. Perhaps the keystone to this whole Porsche is the set of tires Alex chose. Were it not for Alex’s good friend Magnus Walker and his relationship with Pirelli, we would not have this sticky set of Trofeo R tires in proper Porsche 964 sizes. This is the tire Magnus recommends for serious canyon carving, and now I know why. I’m not sure how they’ve done it, but Pirelli seems to have found an alien substance that magnetically bonds to any type of road surface. There was absolutely nothing I could do to upset this Carrera 2’s chassis, up to and including abrupt mid-corner corrections to dodge my way around errant wildlife. From the outside, you would be hard pressed to determine much has been done to this Porsche, and that’s the way I like it. Grabbing a few trim pieces from other models, Alex’s 964 has a unique look that will only be noticed by the Porsche cognoscenti. A set of chrome H4 headlight trim rings are a simple swap that makes a big visual difference. My favorite addition, however, is the simple RSR-style front lip spoiler. It took me several minutes of examining the car to even notice its presence, but the subtlety was noted and appreciated. Big power is great and all, but when it comes to daily driver comfort Alex wanted something that he could exploit to its full extent on his way to and from the office. Having been a long-time Porsche fanatic, he also determined it’d been too long since he’d had an air-cooled car. When the right deal fell into his lap, Alex had to jump at the chance for this one. >When I first opened the door I was happy for a unique set of tan Recaro sportster seats to match the stock tan carpet, but then was disappointed when I folded my 6-foot-2-inch frame into them. The seats are mounted in the perfect place for Alex, who is a bit shorter than I am, but are too far forward and too elevated for my figure. Were it not for the rare small diameter Momo-built Porsche Motorsport steering wheel and Rennline adjustable pedals, I might not have experienced the joy of driving this 964 at all. Even knowing that this is not a fault of the car, I still spent the whole time cursing the angle of my throttle ankle and ended the drive with a bruise atop my head where it contacted the edge of the sunroof surround. Here in the good ‘ole USA we were never treated to the joy of the 964-generation Carrera RS, receiving the shoddy facsimile RS America instead. Our faux RS equates to little more than a standard C2 with a manual steering rack and a rear seat delete; no power upgrade, no lightweight flywheel, and no trick RS suspension. The proper RS wasn’t without its foibles, however, as the lightweight flywheel caused many owners to complain of stalling issues. Alex’s Porsche fixes that. The goal for this build was to combine the RS sensibilities with modern drivability. That couldn’t exactly be accomplished with the nearly 30-year-old Bosch ‘barn door’ flapper box intake system as it reacts to throttle position changes the way a tortoise reacts to lettuce—that is, excitedly, but slowly. Working with a UK-based outfit called ST Systems, a complete Delta 400 plug-and-play ECU system was crafted to work with a modern MAP sensor-style intake tract. Combined with a set of larger fuel injectors, the Sharkwerks primary muffler bypass pipe, and a proper tune, the stock 3.6-liter has been given a new life with excellent throttle sensitivity and a 3.8 RS-aping 300 horsepower. It still uses fuel you can purchase from a pump in California, too. With the engine sorted, reducing the weight of the rotating assembly was next in line. In this case, it was handled without opening the crankcase. The flywheel and pressure plate, a lightweight assembly cribbed from the now-iconic 997 GT3 RS 4.0, work with an un-sprung sport clutch disc to remove appreciable pounds from the end of the crankshaft, allowing the engine to spin up to redline much quicker. A huge improvement over stock, not to mention lighter (and stronger) than even the early RS was from the factory. Shifted through an FD Motorsports short throw, the gear-to-gear change is solid, notchy, and reliable. With snacktime over, Alex and I climb back aboard and take off for more mountain carving. With coastal Pacific Ocean only a few dozen miles away, I have a distinct sensation that feels very akin to surfing. Incredible grip and the traditionally exquisite light and responsive 911 steering lend this 964 an ability to carve corners in a way that feels distinctly connected. That feeling when you’re slotted into a fresh swell? This 964 delivers the same. A gaggle of squirrels, the odd cow (seriously), and even a family of wild boars conspired to interrupt our traverse down the other side of the mountain. Thankfully for me (and for the wildlife), the car was fitted with a Brembo Club Race big brake kit at all four corners and a good set of pads with serious rotor grabbing power. This kit was chosen primarily because it fit behind the stock 17” Cup-style wheels, and provided a decent decrease in unsprung weight, but the braking power was certainly welcome. Pedal feel remained excellent for the entire drive, as likely the larger swept area of the rotors helped keep brake cooling a non-issue, even with heavy, repeated, and sustained downhill braking. I did find the full floating rotors squeaked almost constantly as the rotor ring moved on its bobbins, but the kit was well worth the minor inconvenience. As with any 25 year old car, especially one with nigh on 200,000 miles clicked over on the odometer, there are bound to be minor faults. This 964 is no different. In addition to the brake noise, the power steering system groaned after only a few miles of rapid steering wheel movement, and the sunroof is permanently stuck in the closed position. With as good as the rest of this red beast is, a few transgressions can be forgiven, I think. With a little over 100 pounds removed from the car and a bit more than a 10% power bump, this is a serious 911, far more deserving of Porsche’s RS nameplate than the America was. Rolling back down to the bottom of Mt. Hamilton, I exclaimed to Alex how much fun his daily driver was to drive and how great a job Sharkwerks had done with it. In his familiarly humble and surprisingly quiet manner, Alex said simply, “Porsche did most of the work, we just f****d it up a bit”.